If the UK approaches Brexit with optimism and ambition, it has a bright future based on free trade with like-minded countries around the world to which to look forward, the Australian High Commissioner to the UK claimed last week. Alexander Downer, formerly Australia’s longest-serving foreign minster with a tenure of 16 years, pictured left, made the comments at City & Financial Global’s trade conference, where he also revealed that Australia and the UK were poised to sign a fintech deal that would ensure greater cooperation between the two countries’ regulatory authorities. Asked by the conference moderator which countries international trade secretary Liam Fox should approach the day after Brexit, Downer said he would look to the countries he’s going to get “the greatest benefit” from. 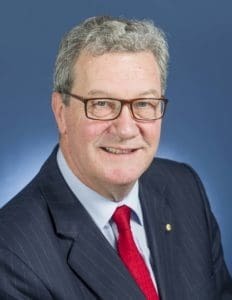 “I think probably I would start with low-hanging fruit,” said Downer, saying that he would start with “countries like Australia, New Zealand, countries which are very like-minded and have similar sorts of institutions, in particular legal institutions, and have the same sort of approach to economic policy”. “So if I could make some agreements quickly with countries like that, they’re not going to transform my economy,” he said. Beyond that, he would look to the US, Japan and China, he said. “We in Australia have managed to make free trade agreements with all those countries, and they are free-trade agreements, that’s not just code for something else. Asked about the trade agreement between the EU and Canada, CETA, he was scathing, saying that it was “preposterous” that it would take seven years to negotiate a free trade agreement with Canada. He said that he didn’t see the UK having any problem with what he termed “freedom of movement issues”: “We have some special visa arrangement with the United States called an E3 which essentially allows business and professional people from Australia to work in the US but we certainly don’t have free movement with the US. “The debate here about what you’re going to do, what sort of agreements you’re going to negotiate with other countries, one of the mistakes you make is that you don’t take into consideration what those countries think. Australia had, he said, “a vested interest in maintaining at the very least the current trade arrangements we have with the UK”. “We won’t want, as you leave the EU, the UK to say that it doesn’t want arrangements or the continuation of arrangements with countries like Australia or America or whatever those countries may be. “So remember, our starting point is that we want to maintain access, including the services access we have to the UK market. “And actually we want to get even better access, and not just for services because we have easy access to services here, and you do in Australia. But Australia was seeking an improvement in the relationship that it has with the UK. “So this assumption that other countries won’t want to do this with the UK and won’t want to do that with the UK, you know, the usual sort of doom-sayer stories about how the sky is going to fall in when you leave the EU, that presupposes that other countries are all lining up to have a shot at you. “Well, I can speak for just about all of them other than North Korea – though I have actually met the North Korean trade minister but not much came of it – and the truth of it is that we are all looking to maintain or improve the arrangements that we have with the UK because Australia is a free-trade country. By way of example, he said that Australia is in the process of concluding negotiations on fintech between Australia and the UK, and the result of that agreement, he hoped, would be “the enhancement of cooperation” between our respective regulatory authorities. The Treasury confirmed to International Investment that these talks – what it called “the fintech bridge agreement” – were are at an advanced stage. “So whether you’re in the EU or not – I don’t want to sound as though I’m a Remainer or a Brexiteer, I’m neutral about that – might be important in that, outside of the EU, you might have greater flexibility to make those sort of arrangements, rather than first and foremost having to get a negotiated mandated agreement from 28 different governments,” said Downer. Downer attacked the idea that the EU was a free-trade body, saying that while many in the UK saw the EU as “the paragon of free trade”, such trade was only within the EU. “We do not see the EU as a free-trading bloc,” he said. “We see the EU as being in many respects highly restrictive and extremely difficult to deal with because of the 28 different countries. “And of these 28 different countries, all of their governments have got different political positions. So when you try to make an agreement with the EU, they impose sort of human rights clauses, such as with agricultural trade, not just with tariff-rate quotas, which bring huge restrictions on trade. “And there are a whole lot of environmental standards and bans on this and that, the precautionary principle may apply to sanitary and phyto sanitary regulations… I could go on but the EU is not a free-trading organisation as we would see it in global terms. It’s going to be easier for us to deal with the UK. There was, it seemed to him, to be one thing missing in the UK, “and that is an explanation of what your position is really going to be”. He went on, “I have to say, some ministers talk about flying the flag for free trade and the WTO, and that’s music to our ears but is the UK really saying, ‘We’re going to tear down our tariff barriers, we’re going to open our markets to the world, we’re going to be the great free-trading centre of the international community’? “That is not crystal-clear to us, and until you make that absolutely clear, you can’t really answer the question about how easily you’ll be able to make free-trade agreements and how your international posturing will go forward. You can’t really. “So if you say, ‘Well, we want to keep the common agricultural policy more or less applying just here in the UK’, how easy is it going to be to negotiate free-trade agreements with other countries if that is your approach? “If it’s the beef industry or the chicken industry or the sugar industry or whatever it happens to be, and it’s the same thing with your regulatory regime. You talk about data protection but funny enough we in the rest of the world, we foreigners, are in favour of data protection as well, we’re not in favour of our privacy being invaded. “You can thump your fist and say, ‘We’re not budging from our EU standards’ but you’ll find it hard to make a lot of the free-trade agreements that you enthusiastically talk about. “Well, first of all, tell me, would you be willing to sign up to all of the conditions of the TPP? Because, by the way, the 11 of us left in the TPP – and we hope to get the US back into the TPP eventually, and I’m sure we will – we’re not going to be willing to renegotiate the whole of the TPP to take into consideration some new approach the UK might want to take. “So if you’re in favour of joining the TPP, that’s good. I’m glad you’re enthusiastic about that. But it might pay to read what the TPP is, because you’re going to have to adopt it all! And that will mean some substantial changes to your domestic legislation, which would probably be a good thing for you, but would involve some change. The UK’s starting point as a country must be to define its approach to economic policy: “We in Australia, after years of going through not great economic performance, we tore down our tariff barriers and our protection unilaterally. “We didn’t say, ‘It’s in our interests to use those tariffs as leverage in our negotiations with another country’. We decided that they were imposing costs on our economy and although, there were specific vested interests protected by these tariffs, just as your farmers are in theory protected by tariffs, we figured the consumers were the most important people. “We figured consumers would benefit because if we let Range Rover or Land Rover get their vehicles into our country, then the consumers can get them more cheaply. So the question in my mind is, are you anywhere near this point here in the UK? Or are you going to say, if we tear down barriers to free trade, we are going to be losers? You’re not losers because you’ve opened up your markets, you can get imports more cheaply of higher quality and get improved living standards, and reduce business costs. “And yes, there are some political adjustments that you need to take into account and you may need to make compensatory payments to some people who might be losers in this process. Trade negotiations are, he said, an opportunity for what he called “micro-economic reform that will make your economy perform more efficiently”. Downer didn’t see, between leaving the EU and negotiating with the rest of the world, this being a win-lose situation: “You’re not going to replace all your trade with the EU with trade with other countries, obviously your trade will continue to be predominantly with the EU. “If all goes well with these negotiations and subject to a transitional period, you might end up with a free trade situation with the EU. Your starting point is totally different from the starting point you would normally have with free trade agreement negotiations, you’re starting with having free trade. “So the question is, are you and the EU going to maintain or erect protectionist measures between you and the EU or aren’t you? You both have a great burden on you to make sure you don’t, because the world won’t want to see that. Therefore, it gives you a degree of flexibility over and above what you currently have with the EU to negotiate trade agreements with other countries in the world. “And by the way, you won’t negotiate a free trade agreement with India, that plane won’t even get off the ground, whatever the media has to say about visas, and that’s because there is such institutional resistance [to free trade] in India. Even prime minister Modi is unable to get his officials to make agreements between the state and the regional governments for anything like even the most basic of free trade agreements. “But you could do it with China – 94% of Australia’s exports to China go in duty-free now, and in five years, that will have increased to 97%, so you could make a pretty good deal with China. Japan, for sure, plus the United States, Australia and New Zealand.